A note from NADRA HQ: Greg Hartmann has been a proud supporter of NADRA for over 12 years. He has continuously added tremendous value in the companies he has represented over the years. 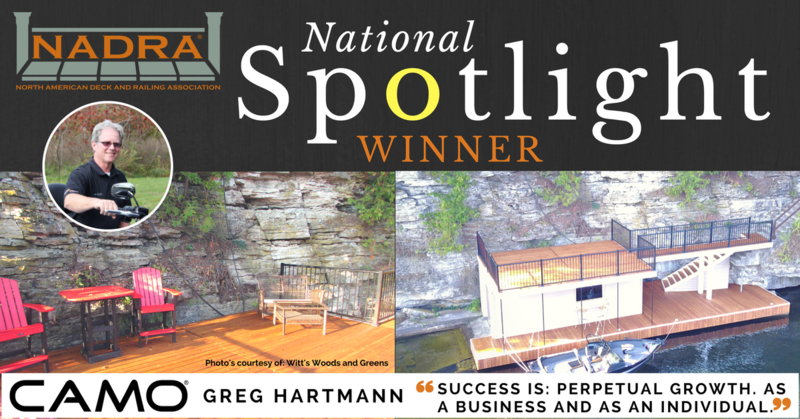 We are so very grateful for Greg’s dedication to NADRA, and his passion for this industry. Thank you, Mr. Hartmann. We want to get to know you, please tell us a little about your business: General Manager of National Nail Northeast. Manufacturer of CAMO deck fasteners. We supply fasteners for over 250,000 decks every year. How do you define success? Perpetual growth. As a business and as an individual. What advice would you like to share with fellow members that you have learned in your career? Always be innovating. If you are not working on something new your competitors will pass you by. If you could ask your fellow industry professionals one question, what might it be? How can I help you be more successful? What would you do for a career if you weren’t doing this? Hold a similar position in a power sports business. 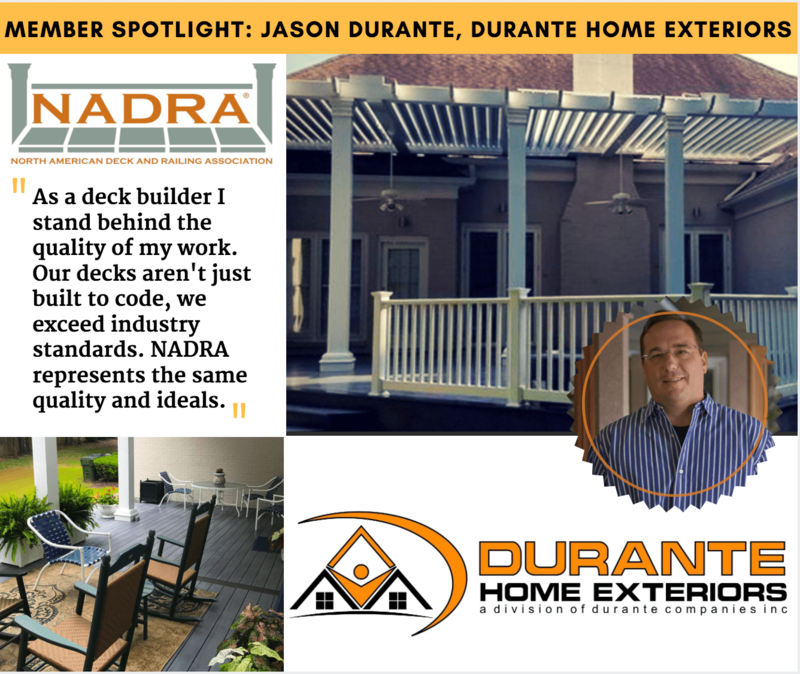 A little more about Greg: Over several years of being a NADRA member, I have met many people with varying roles in the deck industry. All of them inspire me to work harder to improve our businesses together. Several have become great friends. I am enjoying life with my wife, Sue. We live in a beautiful Victorian home in Bristol, CT with several cats and dogs. Living in a house this old gives me plenty of opportunity to use all I learn from the great deck builders and remodelers I serve. Member Category: * Not just a deck builder. Dock builder and outdoor living contractor. What inspired you to join NADRA? Such a great group of people and the ability to help support the only group that promotes growth and expansion to our trade! What was the first thing you ever built? I started building log homes and timber construction professionally. The first build project I ever took on was a deck build on my own home. We want to get to know you, please tell us a little about your business: My business is DOCK & DECK. We specialize in marine construction, decks, and outdoor living spaces. I started my company in 2008. We currently do about 20 Decks a year and about 16-24 docks a year. It is a family business that I started and now have both my sons working with me one full time and one part time. How do you define success? I define success as happiness. If I enjoy what I have and what I do I am very successful. Success is not about how much money you have. It is all about how happy you are day to day. If you could ask your fellow industry professionals one question, what might it be? What would you do differently or what was your biggest mistake in business? How did you overcome that? What would you do for a career if you weren’t doing this? I would run a charter fishing boat at a beach/ocean somewhere warm year round. A little more about Jason: I am a very outdoors kind of guy. I enjoy spending my time outside with my family and friends. I have a pilots license, a motorcycle licenses, a captains (large boats) license, and enjoy all types of car and trucks. If it moves I like to operate it. My family is a huge part of my life and I get to work with them daily. Over the past two years besides running my business I have been the star in a TV show DOCKED OUT on DIY with Scripps Network and continue to work on new shows to share currently. Wife and kids are a part of the show as it focuses on what we do and how we run the business throughout the build process. I reside in Knoxville, TN. What inspired you to join NADRA? I have been in the BM industry for many years, mainly as a manufacturers representative. When I opened my business, I knew the value of being a member of NADRA and believe wholeheartedly in the message. 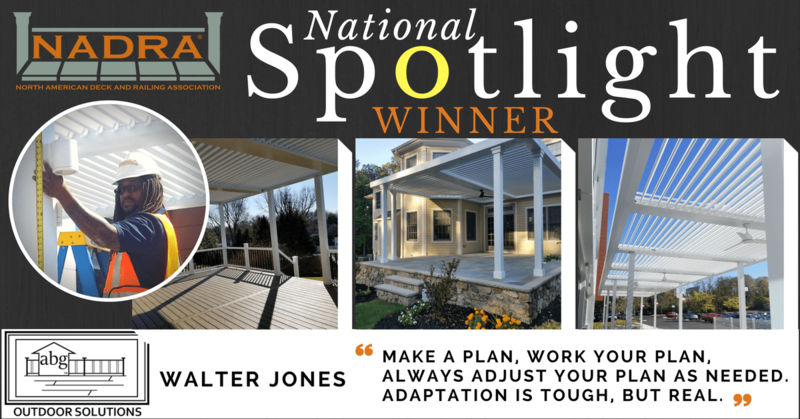 I am passionate about the decking industry and try to instill that when meeting with potential customers. What was the first thing you ever built? The first thing inbuilt was a dog house for my dog – Jordan. I was 14. This was a piece of art. pergolas. We will also complete 5-10 basements per year. How do you define success? Success to me is personal relationships with my family and my friends. I have spent a lot of time on airplanes and traveling to help companies succeed. But at the end of the day, relationships with the people who I care about the most is the most important. What advice would you like to share with fellow members that you have learned in your career? We aren’t competing against one another – we are building an industry. Let’s work together and help each other. If you could ask your fellow industry professionals one question, what might it be? What kind of beer do you drink? Can I get you one? What would you do for a career if you weren’t doing this? I’d probably be selling decking related products! A little more about Brian: Most importantly, I am a father to my wonderful kids, Colby and Macy. And a best friend to Stacy, Luca and Rocco. I am a die hard Michigan Wolverines Fanatic! GO BLUE! During the winter months, I am a High School and NCAA wrestling official. I travel to several tournaments throughout the country promoting wrestling. I wrestled my entire youth life and this is the way I stay connected. I have a bird dog named Dixie, she is an American Brittany. We love hunting upland game birds in North Dakota, Nebraska, and Colorado. I wish I had more time to do that. Lastly, I try to travel as much as possible. The best trip ever was with my best friend, Stacy, to Africa. We went to Botswana for a couple different safari trips, as well as, South Africa. We plan to do more trips in the future. What inspired you to join NADRA? As a deck builder I stand behind the quality of my work. Our decks aren’t just built to code, we exceed industry standards. NADRA represents the same quality and ideals. What was the first thing you ever built? A Dog House! It had siding and a shingled roof. We want to get to know you, please tell us a little about your business: Durante Home Exteriors was established in 2001. I had been working in the industry for many years, and wanted to build a company customers would trust and return to for years to come. Decking, both Composite and Pressure Treated, account for approximately one-tenth of our business and we average 75 decks per year. Durante’s specialty is windows and doors, but my first love is decks! How do you define success? RESPECT, of my employees, customers and peers. What advice would you like to share with fellow members that you have learned in your career? Do it right the first time! A little more about Jason: My fiancé is Ada. I have two sons, Joshua and Jacob, a daughter, Dominique, all of whom work with me, plus an adorable granddaughter, Serena and grandson Keaton. I also have a French Bulldog named Titan. When not working I love to play golf, fish and hike. What was the first thing you ever built? A tree fort. We want to get to know you, please tell us a little about your business: Hickory Dickory Decks started in 1987 in Hamilton Ontario. Today we operate in over 65 cities with franchises and corporate operated local deck companies. We have specialized in low maintenance decking since it was first made. We build over 90 percent low maintenance decks and have since 1995. In 2017 our company will build over 1,000 custom decks. How do you define success? Success is spending quality time with family and friends and doing something you love that makes the world a better place. What advice would you like to share with fellow members that you have learned in your career? Build your business and your life living by the Golden rule of treating all people the way you would like to be treated. Pretty simple. What would you do for a career if you weren’t doing this? Write or teach. A little more about Tom: I am blessed with a loving wife Sue, and 7 great kids. We love spending time together traveling and at the family cottage. Hello fellow deck builders and deck company owners. Hickory Dickory Decks has been a long standing member of NADRA from it’s very beginning. I think the founding of NADRA has helped get deck builders around the world to start looking at their job as a career and a profession. We create outdoor dining and living rooms where our customers can relax after a hard day, and spend some quality time with family and friends. Just think about all the happiness we have helped spread in each and every backyard. We also provide good, honest, well paying jobs to thousands upon thousands of men and women not only building and designing and selling our beautiful backyard environments but also supplying and transporting all the material to jobs around the world. I think this October in Nashville, all professional deck builders should come to the 2017 Deck Expo. Enjoy a few days away from construction sites and challenging work situations. To relax with our peers, share some great stories and a cold beverage or two, and congratulate each of us for helping all of our customers to Enjoy Life…Outdoors! See you there. ~ Tom Jacques, President, CEO and Founder of Hickory Dickory Decks.